posted: April 18, 2016 by: Jessica Vogelsang, DVM/Vetstreet Tags: "Clinic Specials" "News"
Humans often sneeze or have itchy eyes when they have seasonal allergies. But for dogs, the most common sign of allergies is itchy skin. For some of us, spring represents a time of rebirth: winter thaws, budding blossoms, cute ducklings and chicks. But for those of us with seasonal allergies, spring is less benevolent and more horror movie: runny noses, itchy throats, constant sneezes. If you think humans are alone in suffering when spring has sprung, think again! Dogs get spring allergies too. 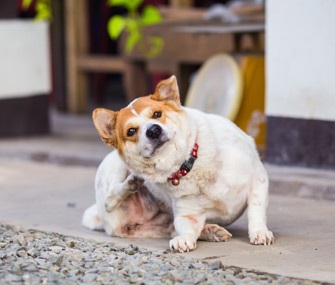 Environmental allergies, or atopy, are the second-most common cause of itchy skin in dogs after flea allergy dermatitis. Although it is hard to know exactly how many dogs suffer from atopy, recent studies estimate the prevalence at about 10 percent of the canine population. Although allergies can strike in any season, spring allergies do tend to trend toward outdoor triggers. According to Dr. Eckholm, while dogs with winter allergies may exhibit sensitivity to things like molds and dust mites, the most common allergies diagnosed in spring are weeds, trees and grass pollens. Because allergic disease in dogs so commonly presents in the skin, veterinary dermatologists are sometimes tasked with addressing atopy. Eckholm stresses that allergies are a lifelong chronic condition, but veterinarians have many tools in their arsenals to manage the problem. “Seasonal allergies cannot be cured but they can be successfully managed in most cases,” she says. The first step in managing allergic disease is establishing a diagnosis of atopy, versus flea allergy dermatitis, food allergy or one of the other conditions that may resemble these. Once the dog is determined to have atopy, Eckholm personally recommends allergy shots (known as desensitization or immunotherapy) as her first line of defense. “ Allergy testing and desensitization is the gold standard for managing allergies,” in her opinion. Dogs are tested for geographically specific allergens, and allergen solutions specific to the individual dog are administered via injection under the skin. As the treatment continues, the frequency of injections usually decreases from every few days to every few weeks. Owners can also be taught how to administer the injections at home. However, it's worth noting that not all dogs respond to this treatment: Various studies of canine atopy show that about 60 percent of affected dogs achieve good or excellent results with immunotherapy. And it's not an immediate fix as it can take close to a year to achieve those results. For dogs who don’t respond to allergy shots or owners who want a different approach, veterinarians also have access to a variety of medications. “These medications range from antihistamines to more potent immune-modulators,” says Eckholm. Each has advantages and drawbacks and response can vary from dog to dog, so it’s important to always use the medications under careful guidance from a veterinarian in order to get the best results. Good luck this spring allergy season!